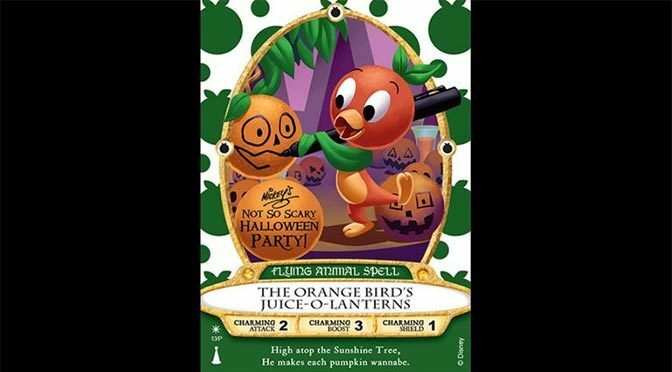 Mickey’s Not So Scary Halloween Party is about to return to the Magic Kingdom in a couple of weeks and Disney World has released the image of the new Sorcerers of the Magic Kingdom card that will feature the classic Orange Bird. This special Orange Bird card will be available at no additional charge for party guests wearing their party wristbands. It can be picked up as early as 4pm at the Magic Kingdom Fire Station. Disney states, “As the storyline behind the card goes: During one of his walks through the Adventureland, Merlin met the adorable Orange Bird. Merlin was so taken with the little fellow, that he created a brand new Sorcerers of the Magic Kingdom spell in his honor. Sorcerers of the Magic Kingdom is a free, interactive game that involves “spell” cards. The guest is attempting to overcome the powers of Disney villains. It’s simple and fun for the whole family. Pick up your starter pack of cards at the Fire Station and play at your convenience. Don’t forget to pick up this special card at the Main Street Fire Station AFTER getting your party wristband. It should be available the majority of the night. Also, be sure to subscribe to Character Locator for full schedules, interaction tips, snack locations, trick or treat stops, rides, shows and all the details of this great party! Kenny, are you going to make a list of all Character meet and greets, with the time that they come out and best times and worst times to get in line?